Golden Boy Promotions boss Oscar De La Hoya believes that the estimated 1 million PPV buys for Saul “Canelo” Alvarez’s fight against Julio Cesar Chavez Jr. this month shows that he is the No.1 star in boxing. De La Hoya not only views Canelo as the No.1 guy in the sport, but also a fighter without any limit to how popular he can grow. Canelo’s fight against Chavez Jr. took place on May 6 of this month on HBO PPV. The 26-year-old Canelo pitched a shutout in beating Chavez Jr. by a 12 round unanimous decision with the 3 judges scoring it 120-108, 120-108 and 120-108. There was no argument from the boxing public over the scores for the one-sided fight. 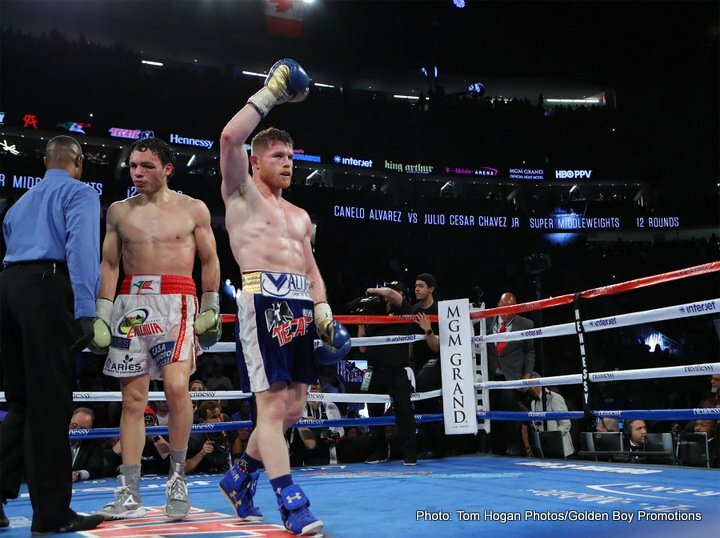 Canelo definitely won all 12 rounds, but the fight was another in what has become a long line of mismatches for the red-haired Mexican star. It’s not that the fight turned out to be a mismatch. Like Canelo’s fights against no hopers Amir Khan, Alfredo Angulo, James Kirkland and Liam Smith, it was a mismatch the moment the contracts were signed. If the PPV estimates ring true, Canelo vs. Chavez Jr. will be the first fight to go over 1 million PPV buys since Floyd Mayweather Jr. and Manny Pacquiao brought in 4.6 million buys in 2015. That fight was an awful one, but it was still loads better than the Canelo-Chavez Jr. fight on May 6. That was one of the worst fights I’ve seen. Chavez Jr. looked like he had just come for the payday. Canelo appeared to take it easy on Chavez Jr. for 12 rounds. The PPV numbers the Canelo-Chavez Jr. fight brought in were a big leap for Canelo from his last 2 fights against Liam Smith and Amir Khan. Even with Canelo-Chavez Jr. bringing in over 1 million buys, that doesn’t mean that buy numbers will remain constant at 1 million. For Canelo to continue to bring in big numbers on PPV, it’s going to require that he faces only good opposition each time he fights. That means that Canelo will need to fight the likes of GGG [more than once], Jermall Charlo, Daniel Jacobs, Jermell Charlo, Demetrius Andrade, Julian “J-Rock” Williams, Erislandy Lara and Erickson Lubin. Those are the most talented fighters at or around Canelo’s weight class. Those are the fighters that are most likely going to give Canelo his most trouble. I don’t consider these guys as being a threat to Canelo: Billy Joe Saunders, Hassan N’Dam, David Lemieux, Curtis Stevens and Ryota Murata. I think there’s a big difference between Jacobs, Charlo, Andrade, Lara, Lubin, Golovkin and Williams compared to Saunders, N’Dam, Lemieux, Stevens and Murata. I’m really hoping that Canelo will fight the better guys so that he can achieve the unlimited potential that his promoter Oscar De La Hoya speaks of. I don’t think Canelo will touch on his unlimited potential if he’s going to be fighting guys like Saunders, N’Dam, Murata, Stevens or Lemieux. We’re going to see shortly if Canelo’s potential is unlimited like De La Hoya says it is, or if he’s just a guy that is doing well because he’s not been facing good opposition since he squeaked by Erislandy Lara. Canelo will be fighting unbeaten IBF/IBO/WBA/WBC middleweight champion Gennady “GGG” Golovkin in less than 4 months on September 16. If Canelo is what De La Hoya thinks he is, then he’ll smash Golovkin and make it look it easy in the process. But if Canelo is nothing more than hype built on a lot of showcase fights against old timers and paper champions, then he’s going to be in a world of hurt on September 16 when he gets inside the ring with GGG. Canelo beating up on former WBO junior middleweight champion Liam Smith and former WBC middleweight champion Julio Cesar Chavez Jr. is a much different thing than getting inside the ring and doing the same job on Triple G.
Chavez Jr. and Liam Smith were arguably paper champions. Chavez Jr. was no longer champion when Canelo fought him. He was a guy that had left his best behind 5 years before that in 2012. There was nothing Canelo proved in beating Chavez Jr. We’d already seen Andrzej Fonfara do a better job of beating Chavez Jr. than Canelo did. Fonfara was then destroyed by Joe Smith Jr. in a 1st round knockout. When you put things in perspective, some fighters don’t look nearly as good. Could Canelo beat Fonfara and Smith Jr? I have my doubts. It’s good thing those guys are in another division because I think Canelo would have a tough time with both of them. It would still be interesting to see if Canelo could beat bigger guys than himself. We’ve seen Canelo fight smaller guys plenty of times. What happens when he fights a bigger guy that isn’t over-the-hill like Chavez Jr? I’d like to think that Canelo will test himself one of these days. Canelo vs. Chavez Jr. could reach as high as 1.2 million PPV buys, according to ESPN. The fight took place at a catch-weight of 164.5 pounds, and the weight seemed to really hurt Chavez Jr., who confessed that he started training camp weighing 215 pounds. For Chavez Jr. to lose all that weight to get down to 164, which is what weighed in at, it had to have taken a lot out of hi for the fight because he looked too weak to fight. Chavez Jr. wasn’t even fighting back. He was just taking punches and looking like he didn’t belong inside the ring with Canelo. If the Canelo-Chavez Jr. fight does bring in over 1 million buys, then it would surpass the 900,000 buys Canelo vs. Miguel Cotto brought in two years ago in 2015.